Awesome and welcome to the forum. That rendering sure opened a lot of eyes to what could be done with that design. I'd be interested in what you are building. I live in Lake Point out towards Tooele. I've build 2 small boats and 3 paddle boards, so I'm done building stuff. Looking for a pontoon boat now. kit and all others, but i am perplexed when it comes down to bulk fasteners. Any who just my rambling based on the last week. Ronb172 im glad to hear there are some fellow glen lers in utah i imagined i would be an island. 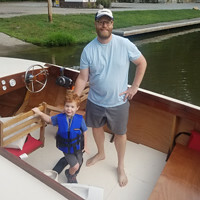 Id love to hear about your experience with the 2 boats you've built. DrBryanJ i gotta say i've seen plenty of wife quotes but yours takes the cake for me, fortunately enough im only 20 so i've yet to deal with these confines. Any who i'm glad to hear from yall and am sure the banter will develop over the course of this builds. Cheers boys! Just finished getting all the materials. I have done the stem and frame number 4 which is the suggested first frame. And so it begins again !! . Looking forward to seeing progress. Is there some updates and pictures you could put up? I'm excited about this build. Hi, I have just purchased the plans for this boat myself so I will follow along with your project if you don't mind. A couple of years ago I built a small 13' 9" runabout from Popular Mechanics called PM38. It was my first venture into boat building. I am planning to make this my second project but I don't know when I will get started. It may be a while before I'll have the space for it. I'm looking to do my first build, I have a bass boat and this peaked my interest. any updates?